The aim of the project is to build a service robot system that should help a human in everyday life. The aim of the project is to build a service robot system that should help a human in everyday life. We have integrated mobile manipulator, robot arm, robot vision and complex sensory system consisting of force, tactile and proximity sensors. We have developed a new type of control, which is suitable for controlling redundant systems composed of two or more subsystems. As an example of a human task we have realized the task of pouring a drink to a glass with a robot. 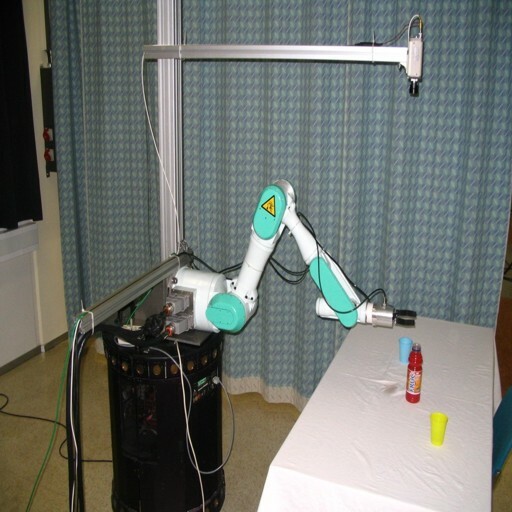 For this application we have combined the industrial robot Mitsubishi PA10 and the mobile robot Nomad XR4000.